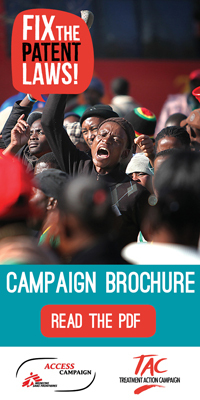 The Treatment Action Campaign (TAC), Doctors Without Borders (MSF) and SECTION27 invite their members, and interested members of the public and local media to attend a consultation regarding the Draft National Policy on Intellectual Property, 2013, which was recently released by the Department of Trade and Industry (DTI) for public comment. Cape Town/Khayelitsha: Blue Hall, Khayelitsha Site C (After Caltex garage street going into the taxi rank. The hall is on your right by the Site C Male Clinic. the consultation will be signposted). The purpose of these consultations is to discuss the contents of the draft policy, and provide opportunities for public input into the joint submission to be developed by TAC, MSF and SECTION27. 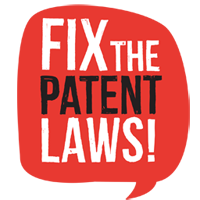 A discussion of the draft policy will be preceded by a brief overview of patents and how they affect access to affordable medicines in South Africa, and the objectives of the Fix the Patent Laws campaign. Light refreshments will be provided.